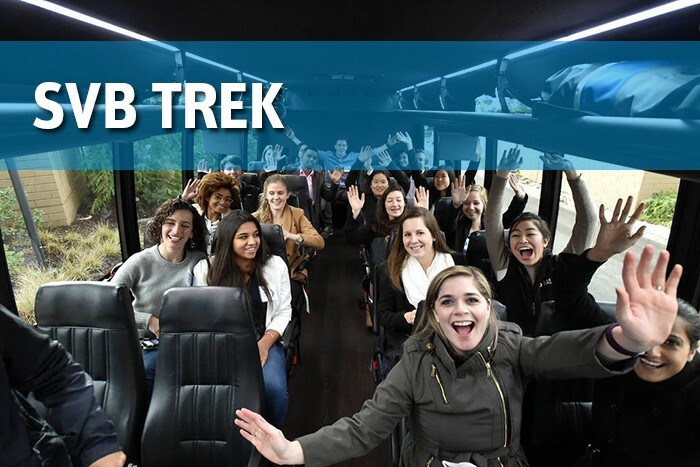 Every January, Silicon Valley Bank invites ambitious, entrepreneurially-minded university students from around the world to come to Silicon Valley for the SVB Trek. During the four-day Trek, we connect the students with creative pioneers, world-class investors and industry leaders through an immersive learning experience, which features salon-style events, interviews with industry luminaries and hands-on workshops. The aim is to provide an opportunity for the students to build a network of peers and advisors, while offering unique insights to help drive the students to the next stage of their career development. We work side-by-side with leading universities from around the world to find a small group of students each year who reflect diverse backgrounds, academic experiences and career pursuits. The selection process is rigorous, and the student entrepreneurs in the Trek Class of 2018 have already achieved impressive accomplishments. They include: the CEO of a battery company that aims to accelerate the adoption of wind and solar power; the co-founder of an agritech company that converts organic waste byproducts into an insect protein for animal feeds; and the founder and CEO of a platform for workers in developing countries to share reviews of their working conditions. Our “guides” at The Trek have experienced startup life first-hand. We encourage these technology leaders to openly recount their startup journey, including their failures. Some of the guides for this year’s Trek include Jeremy Fiance, Managing Partner at The House Fund, Julia Hartz, Co-Founder and CEO of Eventbrite, Justin Kan, CEO of Atrium LTS, Kat Mañalac, Partner at Y Combinator, Kevin Hartz, Partner at Founders Fund, Niko Bonatsos, Managing Director at General Catalyst, Patrick Chung, Founding Partner of Xfund, Peter Boyce, Founder of Rough Draft and VC at General Catalyst, and Ravi Mhatre, Partner at Lightspeed Venture Partners. To learn more about the Trek, please contact us at svbtrek@svb.com and take a look at some of the past Trek experiences here.